Nicola Heath - Possessed of a vast history and sitting at the border between Europe and Asia, Istanbul, Turkey exists in popular imagination as both exotic and cosmopolitan. 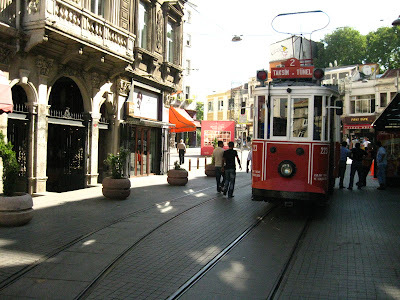 It’s a place where you can feel ok to be a tourist because Istanbul is a city that has attracted tourists since day dot. A first-time visitor has plenty of big ticket sights to see in Istanbul. We ogle Ottoman treasure at Topkapi Palace and admire the restored mosaic floors at the Mosaic Museum, salvaged from the ruins of the Roman imperial palace that lie under the modern city. The citizens of Istanbul must have marvelled at their new church in the fifth century; Aya Sofya (Hagia Sophia) is truly an epic construction. The Basilica Cistern runs underneath the city, a huge Roman artificial aquifer that lay forgotten until the 16th century. It is cool and gloomy and contains hundreds of marble arches lit with red and orange lights. And then of course there is the Grand Bazaar, a maze of stalls and hawkers selling Turkish trinkets, rugs, jewellery, scarves and leather jackets, which we spent a fruitless afternoon chasing (which doesn’t reflect the quality or range of jackets — both brilliant — but more the choosey nature of the interested party). But truth be told, I’m just as happy to wander around food markets and look in the windows of patisseries as I am sightseeing. Lunch is always a highlight of my day. So is dinner, and of course breakfast, which in Istanbul was usually a borek: pastry filled with cheese or chicken or chocolate or something similarly unhealthy. We discover that fresh fish sandwiches cooked by fishermen on their boats by Galata Bridge make an excellent (and cheap) lunch, and I was converted to the cause of nougat and baklava and dried apricots at in-between times. As well as the wonderful food, I will remember Istanbul as a city of bookstores. There are a number of booksellers along Istiklal Cadessi, the most notable being Robinson Crusoe which sells that rare commodity when overseas: English-language newspapers and magazines. It also maintains a brilliant range of English titles, including Turkish fiction and non-fiction (like Orhan Pamuk’s My Name Is Red). Just along our little street was a handful of shopfronts with trays of secondhand books for sale out the front. As well as a secondhand bookstore, one was also a bar and restaurant and showed the Premier League, which made it the most perfect venue in the world. That’s where you’ll find us when we visit again, in the summertime. Nicola Heath lives in London, works in media and travels Europe at every opportunity.